I found 8 caterpillars in my front garden. I named each of them and put them in a plastic container with plastic wrap as a lid with tiny holes in it. The largest one, I named Terence. One week later, he is the only one left!!! 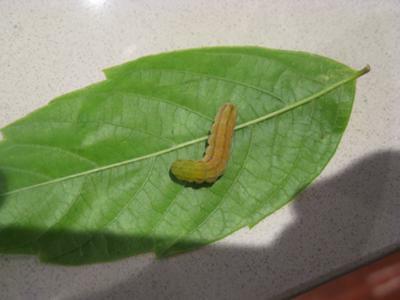 I am wondering if he has eaten the other caterpillars? He has grown 3 times the size and I don't believe the others could have escaped as the venting holes were really tiny. Do any of you know what type of caterpillar he is? Could he have eaten his friends and family? Please let me know. Comments for Is my caterpillar naughty? Ours is turning into a cocoon! just wondering if you received a response to the caterpillar name? I think I have the same kind so I am just wondering. I found him in my lettuce that I have growing in my garden. did he ever turn into a butterfly or moth?